When reading information about algae you always see the terms "micro" and "macro" used, but what do these terms mean? First of all, let's take a look at each definition from the American Heritage Dictionary of these three words, starting with algae. al·ga n., pl.-gae. Any of various chiefly aquatic photosynthetic organisms, ranging from single cell forms to giant kelps. (Lat., seaweed). We'll save the discussion about photosynthesis for another article, but here are a couple of definitions relating to algae that will help to explain how they function. pho·to·syn·the·sis n. The process by which chlorophyll contained cells in green plants use light as an energy source to synthesize carbohydrates, from carbon dioxide and water. -pho·to·syn·the·size v. -pho·to·syn·the·tic adj. -pho·to·syn·the't i·cally adv. chlo·ro·phyll n. Any of a group of green pigments essential in photosynthesis. One point we do want to make about photosynthesis is that, different algae can contain one or a combination of three types of chlorophyll, along with different classes of photosynthetic pigments (color compounds) as well as accessory pigments, all that absorb varied ranges of light in the light spectrum. Because of this, most green algae require moderate to bright lighting, while red and brown species will thrive in low to medium light levels. micro- or micr- pref. 1.a. Small: microcircuit b. Abnormally small: microcephaly c. Requiring or involving microscopy: microsurgery. Ok, now let's take our definition of algae and put it together with micro and macro to see what we get. microalgae: small microscopic aquatic photosynthetic plants that require the aid of a microscope to be seen. In a previously posted Web article written by Nick Dakin titled Algae Enhancement, when addressing the topic of Micro vs. Macro, he stated that "'Micro' applies to single-cell or groups of cells joined together. Their existence may be encountered as drifting phytoplankton or substrate occupiers and include the nuisance forms of 'slime' algae, as well as the welcome rock encrusting calcareous forms". So, if these algae are microscopic, then why can you see them in your aquarium? This is easy. When these single-celled microscopic algae organisms join or chain themselves together in large enough numbers, they then become visible to the unaided human eye. Even though red slime (cyanobacteria), brown (diatom) and some dinoflagellates are not "true" algae at all, these fall into the microalgae category. macroalgae: large aquatic photosynthetic plants that can be seen without the aid of a microscope. Nick Dakin further explained in his Micro vs Macro discussion that," 'Macro' always refers to the larger species and can easily be recognizable as plants. These are generally the ones that attract the marine aquarist." 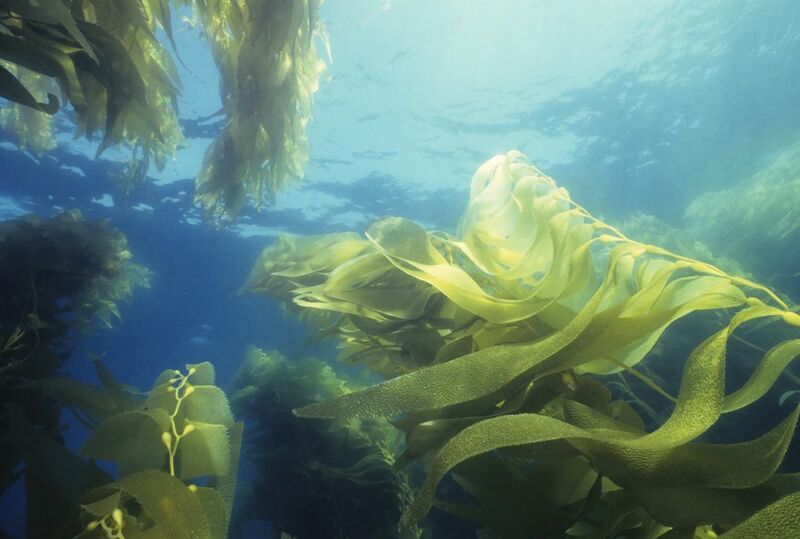 Macroalgae come in many colors including green, red, brown and blue, as well as in a variety of forms - some growing tall, with others growing as mats. The most familiar types can generally be divided into three groups: Green (Chlorophyta), Red (Rhodophyta), and Brown-Kelps (Phaeophyta - related to Chromista). How Do Phosphates Affect My Saltwater Aquarium?